Though this 1957 photograph is by Imogen Cunningham, its subject is Bay Area artist Ruth Asawa (1926–2013). For decades Asawa has been little known beyond the West Coast, and is all too belatedly finding herself rewritten into the history of American art. Rather than concentrate on photographer Cunningham, this post focuses on Asawa, her diaphanous wire sculptures, and her complex identity as a Japanese-American woman artist. Cunningham’s photograph is a quiet yet evocative image: Asawa sits with her face occluded by the semi-transparent curvature of one of her hanging wire sculptures. She’s surrounded by her four children, ranging from toddler to six years old. Each, including Asawa, is engaged in and absorbed by his or her own activity: reading, playing, observing, drinking, and making. The iconic photograph has often been read in gendered terms, focusing on Asawa’s demonstrated domesticity, femininity, and passivity. Like too many women artists, Asawa has been positioned primarily as a wife and mother—identities that override her identity as an artist, which can and should include these other identities. As curator Helen Molesworth discusses in her recent paper delivered last month at the Smithsonian, “Ruth Asawa: ‘San Francisco Housewife and Mother’,” this image has additional import, positioning art making as a social activity, and Asawa, therefore, as a citizen above all else. Black Mountain was a transformative place and time for Asawa, creatively as well as socially: incorporated into Black Mountain’s utopian environment was an attitude that expanded what art can do for society. 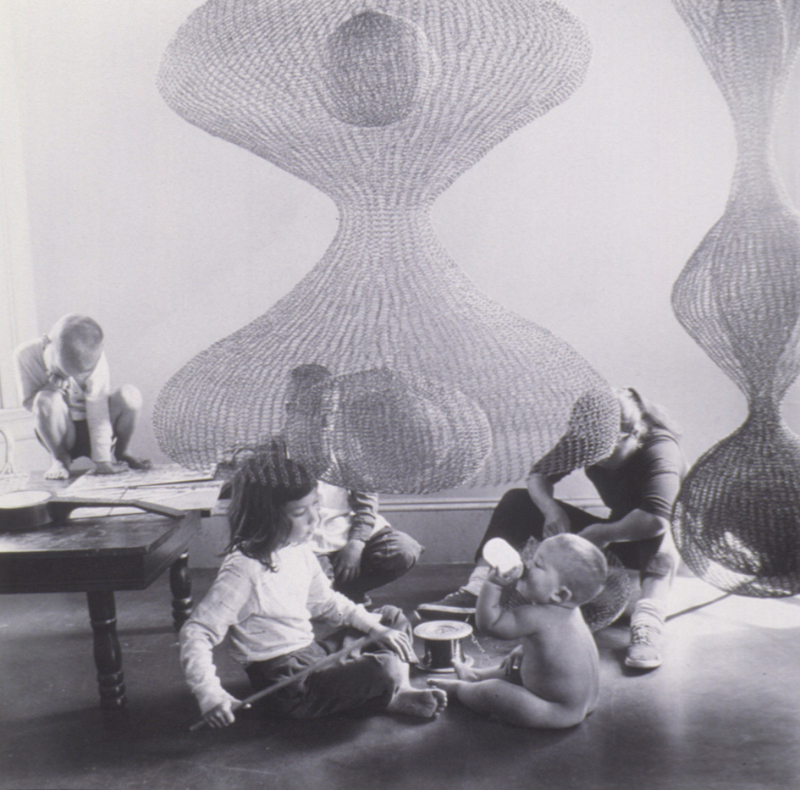 Therefore, to be an artist is to be a citizen—engaging actively in the world and making choices alongside others.² Though Cunningham’s photograph captures Asawa in her home, surrounded by her four (of six) children, central to the visual narrative is her artwork, which is inextricable from her role as an artist, wife, mother, and citizen. ¹Ruth Asawa, “Oral history interview with Ruth Asawa and Albert Lanier, 2002 June 21-July 5,” interview by Mark Johnson and Paul Karlstrom, Archives of American Art, https://www.aaa.si.edu/collections/interviews/oral-history-interview-ruth-asawa-and-albert-lanier-12222#transcript. ²Helen Molesworth, “Ruth Asawa: ‘San Francisco Housewife and Mother’,” filmed September 12, 2018 at Smithsonian Institution, Washington, D.C., video, 1:07:05, https://americanart.si.edu/videos/clarice-smith-distinguished-lecture-series-scholar-helen-molesworth-154476.